Our newest collection of guest rooms are lavishly appointed with the finest finishes complementing the stunning natural beauty of their location. Each one of these luxurious coastal guest rooms were individually designed using sophisticated fabrics and exquisite furnishings with a private deck or patio to allow for full enjoyment of the serenity of their seaside setting. The Signature Water View accommodations offer sweeping panoramic views of Round Cove or Pleasant Bay from both the room and the patio or balcony. 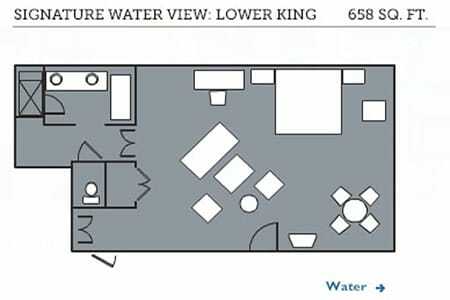 They include both first and second floor offerings, and all have either one king with a queen pullout sofa or two queen beds. The first floor rooms are more expansive and offer outdoor patio fireplaces or fire pits. The second floor rooms benefit from the improved view due to their elevation and have vaulted cathedral ceilings giving the room a more spacious feel. All rooms in the collection offer indoor gas fireplaces that can be enjoyed from both the living area and the air jet soaking tubs, marble bathrooms with separate walk-in shower, 42” flat screen televisions, iPod docking stations, fine linens including bespoke bed covers, and plush robes and slippers along with all expected resort amenities. We offer guests the option to participate in our green programs. Our initiatives focus on recycling, electrical energy conservation, and water conservation. Any savings from guests’ participation will be donanated to charitable enterprises that support preserving the local environment.